The issue with dieting in the modern world is that it almost becomes religious. It’s easy to do. Our bodies are so personal that we create an attachment to anything that’s supposed to help us. Not to mention, it can become a social event within your circle of friends or with family. No longer do people say “I follow paleo” or “I use Atkins” they say “I am paleo” and “I am keto”, and this means that the results are often exaggerated. On a larger scale, dieting is now big business. Associating a label to yourself separates you from the market and helps you stand out. If people want to find out how to lose weight, then why wouldn’t they try the ideas of someone who’s so passionate about the effectiveness of their particular way? Promising dramatic results immediately attracts far more customers than balance and patience. This is the exact reason why new and useless fads are created. Now, every fad has its benefits and drawbacks, the issue comes with the blindness to which people follow and describe them. For instance, high-fat, low-carb diets can be and have been very useful for many people. They also tend to contain a lot of protein to promote lean mass whilst minimising processed products such as cakes and pastries. However, they are by no means the be all and end all diets for health or the best solution for everyone. They work for some and have their advantages, but they’re not the cure for all illnesses. One of the biggest fads to ever enter mainstream media is the act of juicing i.e. turning whole fruits and vegetables into juice to takeover, partially contribute to or supplement your diet. Almost everyone knows at least one person who’s tried juicing. Today, we’re going to decipher the good parts of juicing, the bad parts, and whether you should use it whatsoever. Let’s kick off on a happy note and focus on the benefits juicing has. For starters, it completely eradicates typical nutrient-spares foods. Much of the modern world’s eating habits are based off of convenience opposed to health which causes people to turn to foods such as chocolate, crisps, and pre-made sandwiches. The issue with these products is that not many people actually know what’s in them. They’re fine to eat every now and again, but without knowing how to effectively fit them in your diet, their palatability can be quite dangerous. Juicing takes the convenience aspect but switches the focus onto vitamin and mineral rich fruit and vegetables, effectively making for the best of both worlds. The other issue with modern diets is that eating 5 fruits and vegetables is seen as an achievement. In actuality, 5 servings of fruits and vegetables is the minimum. You should really be striving for double that. Juicing allows for a mix of different fruits and vegetables to be consumed. You can also “sneak in” a lot of vegetables you otherwise wouldn’t like or eat. For instance, a handful of spinach can be hard to eat when it’s uncooked, but blitzed into a juice it’s completely unnoticeable. Leafy greens are extremely nutritious, but are often substituted for iceberg lettuce because of its texture. The third big benefit is the taste. Not everyone is blessed with the right taste buds to find natural foods enjoyable to eat. In fact, due to all of the work that goes into flavouring processed products, our palate can change to find natural foods boring or unengaging. Why would you want to eat a normal plate of seasoned chicken, steamed vegetables and boiled potatoes when you can eat battered chicken wings, sugar-filled baked beans and heavily fried French fries? Juicing reduces the natural “earthy” taste associated with many micronutrient-dense vegetables, combines them with fruit which many people find more enjoyable, and turns them all into one easy-to-drink beverage. This makes consuming a higher daily quantity of vitamins and minerals far, far easier for a lot of the population. Lastly, the food that you juice tends to be very low in calories. Compared to items such as bread, cereal, butter, cheese, and meats, fruits and vegetables are much lower in calories gram for gram. This can make it helpful or weight loss which is usually when the diet is recommended. As juice clearly contains a high amount of water and liquid, this helps increase the volume of your stomach which signals to your brain that you’re full. As you can see, there are a lot of benefits to juicing that can make it extremely appealing. However, as with anything there are some downside, and with juicing these downsides are particularly prevalent. Despite juice diets being high in fruits and vegetables, they’re extremely low in fibre. In fact, all fibre is almost completely eradicated from the diet when taking the juice from the food. This can severely affect your health, digestion and weight loss efforts. Most notably, fibre helps to regulate your bowel movements by increasing the weight of your stool and making it easier to pass. Fibre-less diets that are high in liquid can cause extremely uncomfortable diarrhoea. Fibre also reduces the risk of developing diseases along your digestive tract alongside heart and cardiovascular disease by increasing “healthy” HDL cholesterol and reducing “bad” LDL cholesterol. It even helps to control blood sugar levels by blunting the rate of sugar absorption into the blood, therefore also reducing your risk of diabetes. Fibre is an often overlooked but extremely important part of our diet that juicing neglects. As well as this, juice in and of itself actually isn’t very healthy. The healthy part of fruit is the vitamins, minerals and fibre content whereas the unhealthy part is all of the sugar. 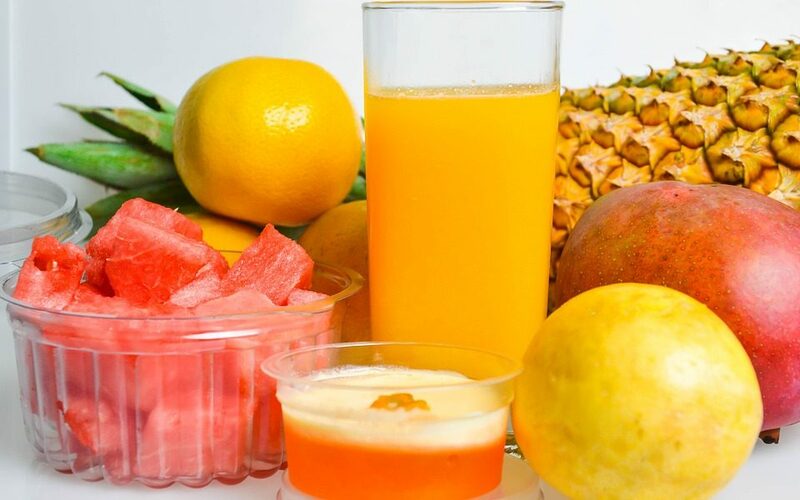 Due to the micronutrients being held in both the liquid and solid part of the fruit, juicing takes a lot of the sugar and removes a lot of the micronutrients behind. The digestion of liquid occurs a lot quicker when it’s not taken in with something solid because there’s no barrier to breaking the food down. This means that all of the fructose contained in the food hits the blood very quickly, spiking blood sugar levels and insulin release. Both fructose and glucose are sugars, but they aren’t metabolised the same. 100% of the fructose that you eat is broken down by the liver compared to just 20% of glucose. As many aspects of your body rely on glucose, it’s an important and heavily utilised part of the diet. On the other hand, fructose turns into a variety of other things which are more commonly associated with insulin resistance and liver disease when eaten in high doses. This isn’t to say that fruit is bad, but specifically only drinking the juice and excluding the fibre can cause issues for many people. You’ll also probably already know that fruit and vegetables aren’t particularly high in protein. Vegetarians and vegans can get away pretty easily by including meat substitutes, beans, nuts, seeds, and lentils, but none of these translate very well into a juice diet. Protein helps to promote metabolically active lean tissue. Fat doesn’t require any calories to stay on the body, but organs and muscles need energy to function and perform. This means that the more muscle you have, the higher your metabolism is and the easier it is to lose weight. This brings us onto another issue, juicing isn’t high in fat, either. There are essential proteins and essential fats, but not essential carbohydrates. This means that your body can actually function on an extremely low carbohydrate intake, hence why diets like Atkins don’t kill people. Yet, diets particularly low in fats and protein can cause severe health problems such as issues with your hormonal health and brain function. Besides, if you care about your athletic performance, you’re going to need the protein in order to ensure adequate recovery. The main issues with juicing arrive when it starts being used as a regular meal replacement or takes over the entire diet. When juices are consumed instead of solid foods, the benefits of the solid foods are taken away and the juice can’t make up for it. If you do want to incorporate some form of juicing into your diet, then it’s best to do it supplementally or on occasions. As well as this, you’ll want to make sure the juice contains all of the right ingredients. Alongside the juice from healthy fruits and veg, it’s wise to include some form of fat. For example, chia seeds and melted coconut butter provide the body with antioxidants and healthy fats to improve your energy, deliver essential macronutrients and blunt the absorption of sugar into the blood stream. If you’re looking to improve your athletic performance, then you might want to think about adding in nitrate containing juices such as beetroot juice. Studies have shown that athletes who consume nitrate containing drinks such as beet juice were able to pedal for longer whilst having lower resting blood pressure. At the end of the day, nothing is bad for you in moderation. The only issue is when something is taken to the extreme. If you enjoy juicing and want to do it every now and again, then it can be a fantastic way to add in a variety of fruits and vegetables very quickly. Yet, you might want to think twice before committing to a full diet centred around it.